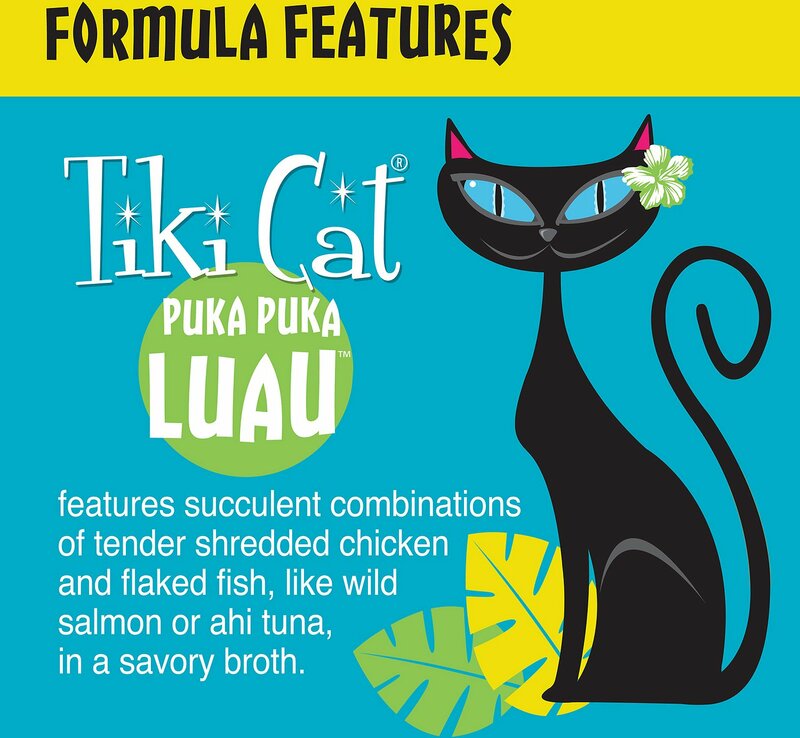 Bring some lei-worthy nutrition to your kitty’s bowl with the Tiki Cat Puka Puka Luau Succulent Chicken in Chicken Consomme Grain-Free Canned Cat Food. 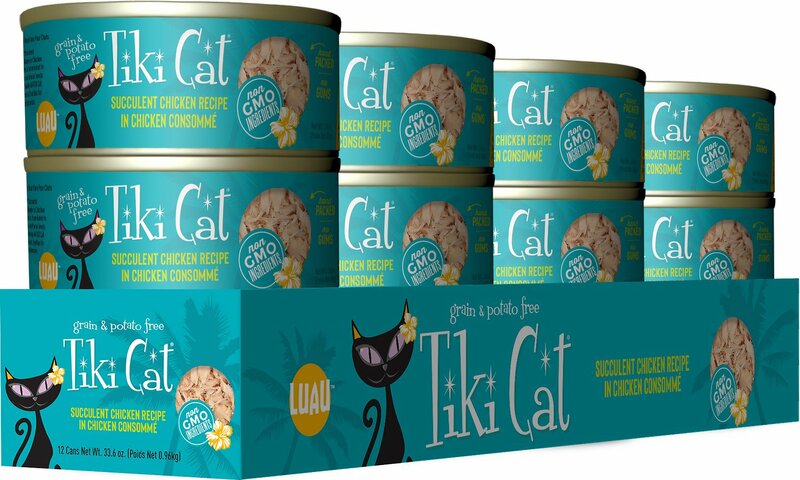 It’s a luau of flavors purr-fectly fit for your furry carnivore, with succulent shredded chicken breast as the first ingredient, slowly simmered in real chicken broth. Since it’s made with actual broth, it provides plenty of moisture to keep your pal hydrated and support digestive and urinary health. 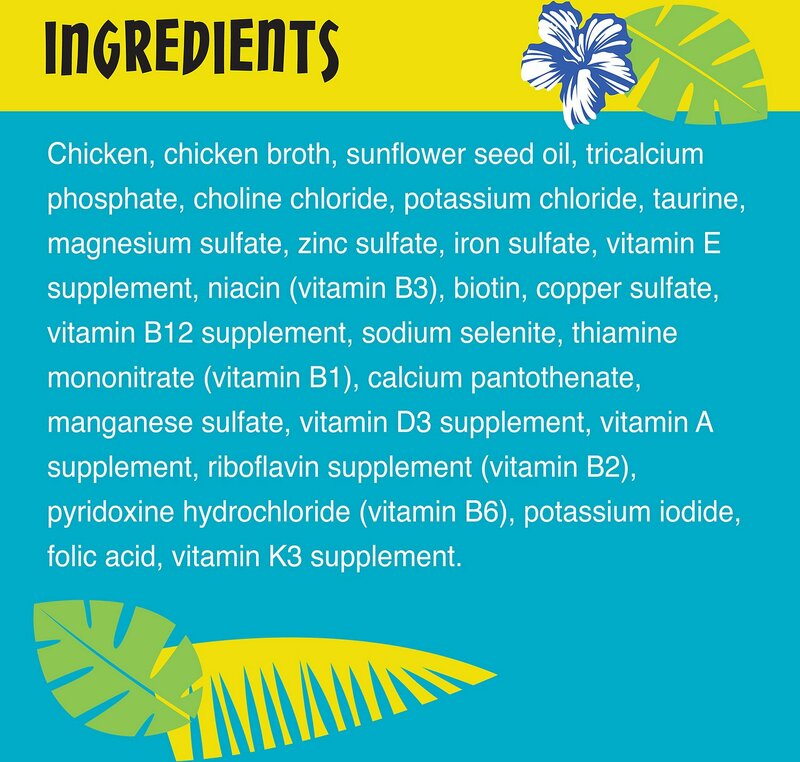 And it’s packed with essential vitamins, omegas, minerals and taurine so it’s a complete and balanced diet for cats of all ages, with zero grains, gluten, carbohydrates, starches or flours. 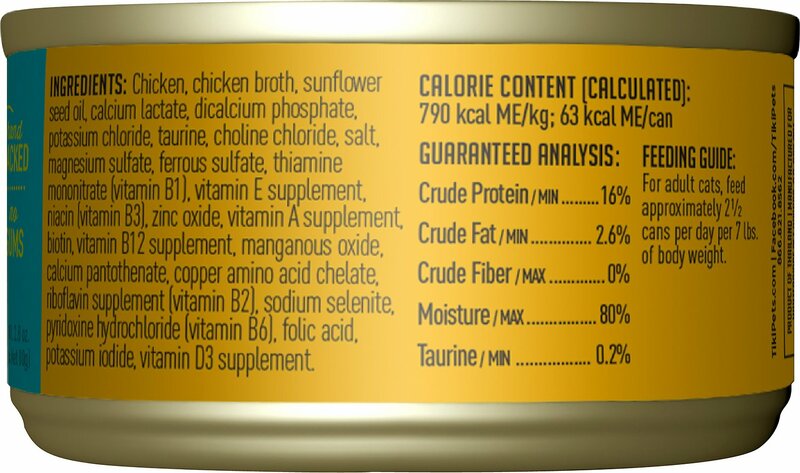 Hormone and antibiotic-free shredded chicken as the first ingredient for animal-sourced protein to meet the nutritional needs of carnivores. High protein to support healthy muscles plus sunflower oil rich in omegas that nourish the skin and coat. Provides a balanced and complete diet for cats of all ages with essential amino acids, vitamins, minerals and taurine. Luxurious consomme-based formula is great for picky eaters, and contains no grains, gluten, carbohydrates, starches or flours. The best way to transition to a new food is to switch gradually over the course of 7-10 days. For example, make a mixture that contains 25% of the new food and 75% of the old food and feed that for three days. Then make it 50-50 for three more days, then 75% new food and 25% old food for three more days. 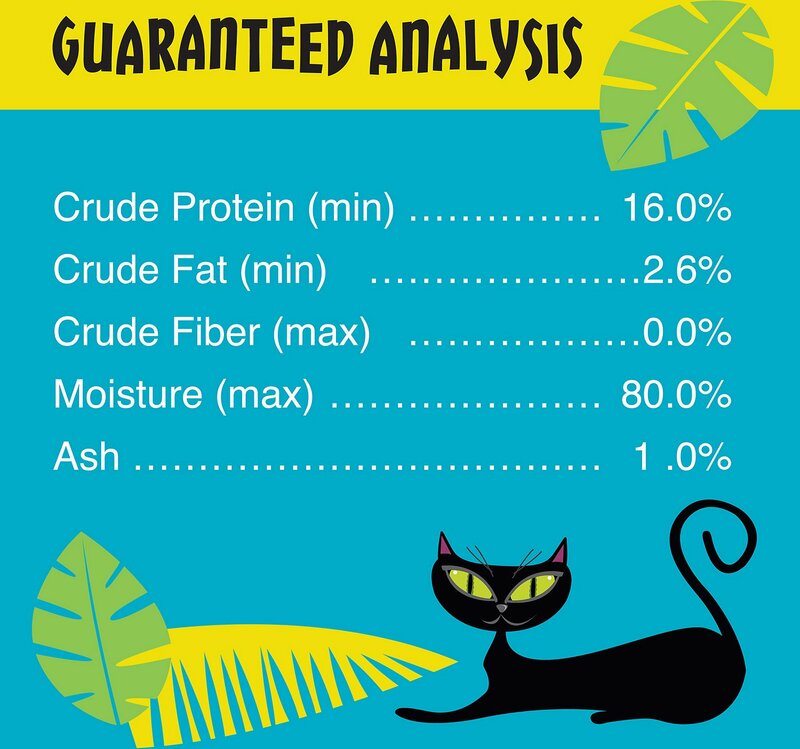 If your cat seems comfortable with this progression, you can start feeding 100% new food. If at any time your pet starts vomiting, has loose stools, or appears constipated, slow the rate at which you are switching the food. If problems continue to occur, consult your veterinarian. The food looks like shredded chicken for human consumption. My ultra thin, super model cat, who is very picky and only really likes human food seems to like this quite well. My other cats, who are much less picky, don't like it much at all. They seem to prefer the old fashioned pate style food. I'm not blaming the food, but I have several cats to feed, so this probably won't be on my autoship list very often. Healthy, high-quality food at a reasonable price! I think this food is great in terms of you can clearly see its real shredded chicken and it’s very basic food however it may be to the point it’s too basic. My cats will eat it if I leave it out long enough, but I believe since it doesn’t have a strong smell/taste they don’t love it. I say give it a try and if anything donate whatever you have leftover to your local shelter! 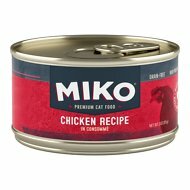 My boys love the taste of this food, and I love the price. It's almost like a cheaper version of Weruva paw lickin chicken, which they also enjoy, but is much more expensive. Food is definitely human quality. Smells great, nothing but shredded chicken and juices. One cat, a shelter rescue, absolutely will not touch the stuff. The other cat ... a feral adopted... will eat it ... only sparingly. Three stars for quality ... I subtracted two for lack of edibility from my felines. This is just like the Applaws brand but with extra ingredients (that you can’t actually see). It’s like buying canned shredded chicken from the grocery store for people. 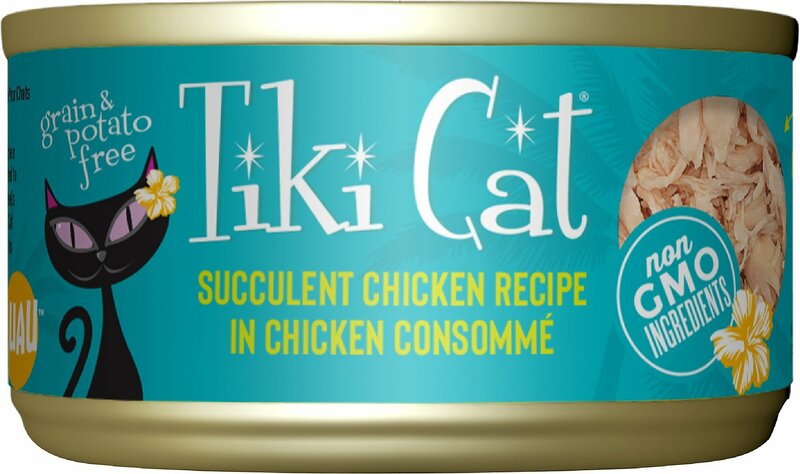 If your cat hates everything but chicken and is as picky as mine, this food is a winner. I got this for my old kitty with early stages of kidney disease. This flavor has lower phosphorous content compared to most commercial foods and high quality protein with low carbohydrates. He loves this food and has actually started gaining weight! While it's not as low in phosphorous as a prescription diet, he will actually eat this food compared to the prescription diet which is the most important thing of all. Despite being packed full of chicken, my cat does not really like this item. It's somewhat bland and she barely ate any of it. So, in order to not waste it, I have to mix it with other more flavorful soft food. I would not purchase this item again. My cat is a picky eater. She likes junk food, friskies and fancy cat, and treats. The healthier it looks to me the more likely she won't eat it. She eats this, it looks healthy, we both win.